Bot Net CC: This dimension is based on a list of IPs where botnet command and control (CC) servers are known to be running (or were running in the past). By looking for IPs that are communicating with these CC IPs you can identify hosts (or subscribers) in your network that are potentially infected with malware or otherwise participating in botnet activity. Threat List Host: This dimension includes a broader set of potentially malicious IPs on the Internet. The IPs are identified as malware distribution points, phishing websites, spam sources, etc. When this column is populated in Kentik Detect’s datastore we identify the specific type of threat associated with the IP. This dimension can help hosting providers identify IPs in their own network that are “doing bad stuff,” but it can also enable any network operator to identify client IPs that are talking to remote IPs on the list. To illustrate the use of Bot Net CC, let’s go back to the fictional enterprise from our last post, Pear, Inc. The savvy reader is probably already aware that a popular method of Distributed Denial of Service (DDoS) attacks is to infect hosts with a virus. These hosts then communicate with a Command and Control (C&C) server that tells them where to send attack traffic. Pear’s IT Security department wants to see if they have any hosts on their network that have been compromised and are communicating with a C&C server, thereby participating in a botnet. Click anywhere in the pane to open the Filtering Options dialog. In the Ad-Hoc Filter Groups pane, click Add Filter Group. Change the dimension to Destination Bot Net CC. After our query configuration is complete, we click on the Run Query button at the top of the sidebar. If there were four infected hosts then the query would return a graph that looks similar to the below. Based on these results, the IT Security staff at Pear would know which hosts to examine for botnet malware, so it can be identified and removed. From the drop-down View Options menu at the upper right of the Data Explorer display area (above the graph), choose Add to Dashboard » New Dashboard. The Add Dashboard dialog will open. 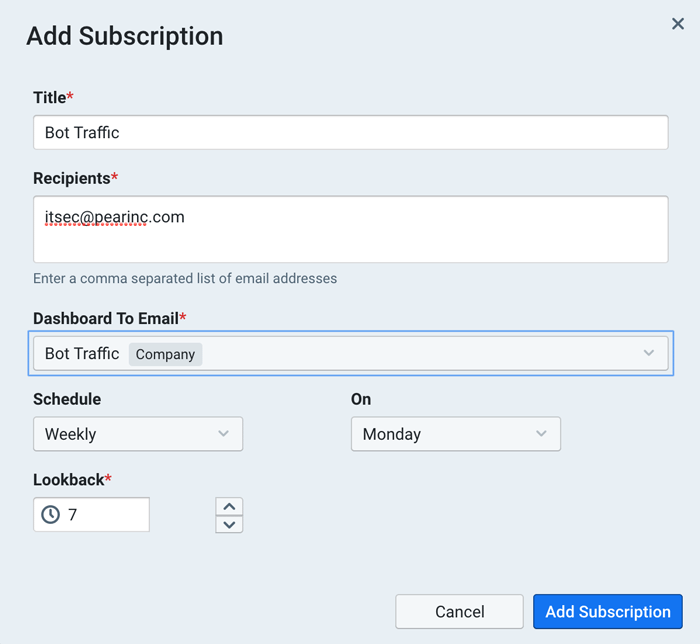 Enter “Bot Traffic” in the Name field, then click Add Dashboard in the lower right corner. The Add Panel dialog will open. Leave the dialog settings at defaults (the name of the panel will be “Top Source IP/CIDR, Dest Bot Net CC by Average bits/s”) and click the Add Panel button. You’ll be taken to the new “Bot Traffic” dashboard. Click Admin in the main portal navbar, then choose the Subscriptions page from the sidebar. Click the Add Subscription button at upper right to open the Add Subscription dialog. Fill out the subscription settings as shown in the screenshot above, then click the Add Subscription button. If the Pear IT Security department were to follow the steps above, they would receive an email every Monday with a list of infected hosts covering the previous seven days. 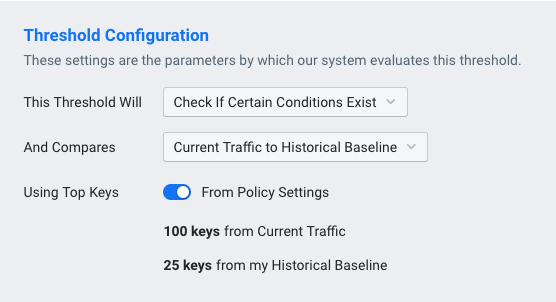 General Settings tab: We give our policy a name and change the drop-down Policy Dashboard menu to Bot Traffic, the dashboard we created in the previous section. 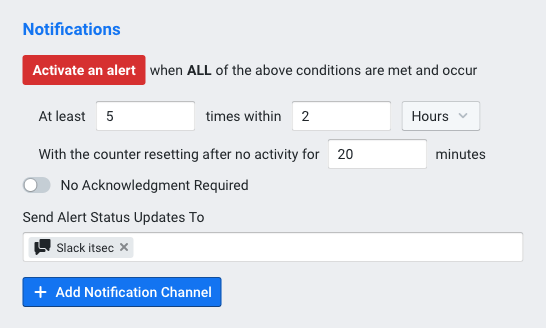 Note that we leave Silent Mode enabled so that the alert does not activate while the alerting system is determining what’s normal (the baseline). 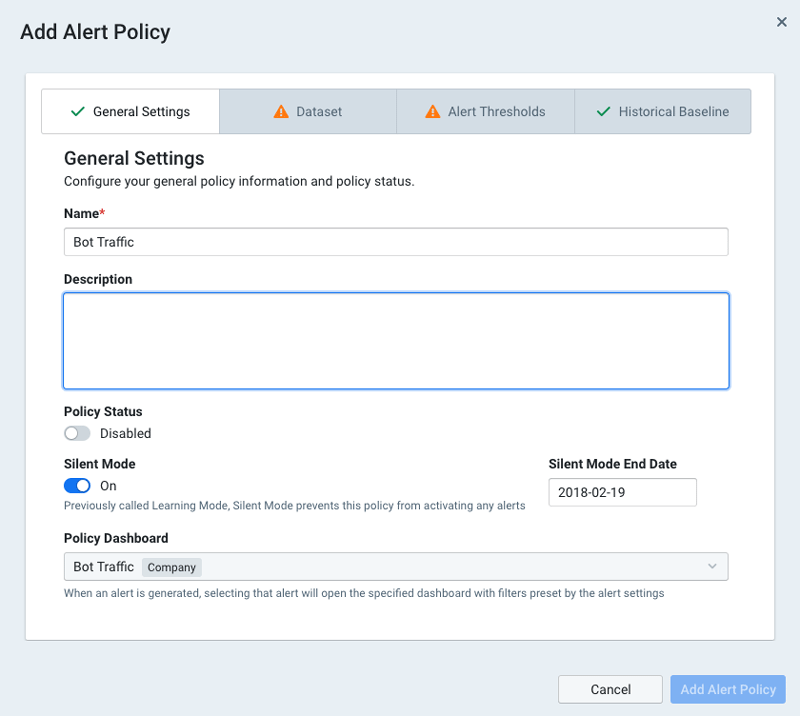 It’s also nice to add a description so that everyone in the organization can see at a glance what this policy is for. Dataset tab: In the Data Funneling pane we click anywhere in the Dimensions selector to add the same dimensions we used in our original query: Source IP/CIDR and Destination Bot Net CC. We’ll also click in the Secondary Metrics selector and choose Bits/second. Moving down to the Building Your Dataset pane, we change the Maximum Number of Keys Analyzed Per Evaluation to 100. We leave everything else at default so the system auto-calculates the Minimum Traffic Threshold. Alert Thresholds tab: We choose a criticality level (e.g. Major) from the list at left, then set the switch at right to Enabled, which reveals a number of panes containing controls. In the Threshold Configuration pane, we choose Check If Certain Conditions Exist from the drop-down This Threshold Will menu. Leave the other settings at their defaults. Moving down to the Conditions pane, we set a threshold of Greater Than 1 kpps. 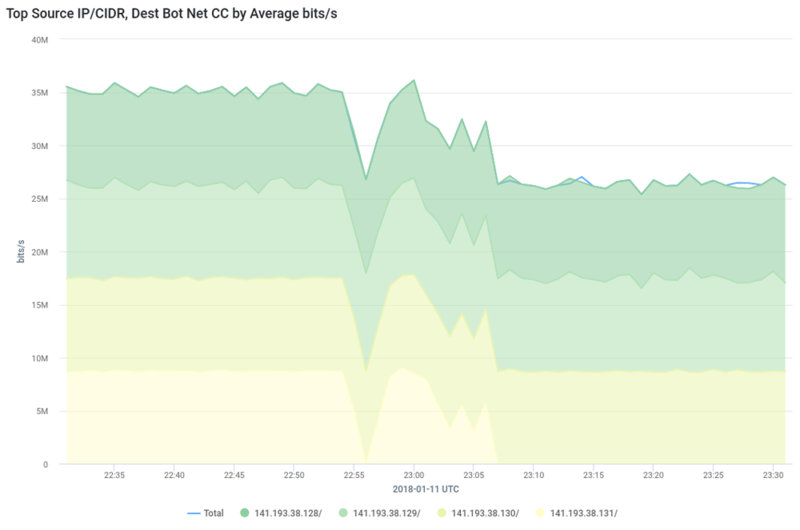 This will trigger the alarm if any of the hosts on Pear’s network are sending more than 1000 packets per second of traffic to a known Botnet C&C server. The final pane that needs our attention is Notifications. Click anywhere in the Send Alert Status Updates To selector and choose Slack itsec. Note that this notification channel must already have been configured under Alerting » Channels. For more information, check out our KB article on creating a notification channel. Historical Baseline tab: Leave default settings. This is just a taste of the ways that Kentik Detect’s new Threat Feeds information can enable your company to see compromised hosts on their network that they’ve never been able to see before. This insight can be used for both proactive monitoring and data forensics to protect the company’s infrastructure. If you are an existing customer and would like help setting up or using this feature, get in touch with our Kentik support team. If you are not already a Kentik customer, it’s easy to get started: request a demo or sign up for a free trial.